Dennis is the founder and head Brazilian Jiu Jitsu and Judo instructor at HYBRID. Dennis has competed at every belt level in Judo, Brazilian Jiu Jitsu, and submission wrestling tournaments as well as in MMA. Dennis recieved his black belt in Judo from Local martial arts legend Gus Carper and is a 3rd degree Brazilian Jiu Jitsu blackbelt from Pedro Sauer and is one of the first 30 Blackbelts promoted by Pedro. HYBRID is also an official representative of Pedro's association. By trade Dennis works for Roanoke Fire/EMS as a firefighter/Paramedic. -Elite Combat Challenge MW champion. -Va State Judo Championships.-’05 Black belt division LW 3rd place of 20. HYBRID doesn't just have 1, we have 6 Brazilian jiu jitsu blackbelts. All, directly certified from Master Pedro Sauer. We are the only Martial Arts facility in the valley that has this to their credit. Each having their own distinct style of jiu jitsu, you get to learn from each of them and add it to your arsenal. In fact, we are the only school on the western side of the state with this many blackbelts in one facility. his Level 2 Muay Thai instructorship with the United States Muay Thai Association of America. 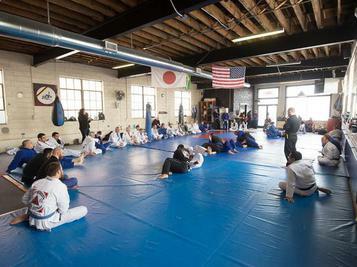 TIm has trained directly with the likes of some of the most notable instructors in the world, including Sirichai Sirisute, Frank Cucci, and Pedro Sauer, to name a few. Thos is a Gracie Jiu Jitsu Brown belt and has 9 years of Brazilian Jiu Jitsu inder his belt. Thos is at the gym almost every day and teaches our kids class on Monday & Wednesdays. Dave is a 2nd degree black belt in Judo and has been involved for over 25years. Dave wrestled both in high school as well as college. Dave received both his black belt in Judo and his rank of second degree directly from Roanoke's own Gus Carper. Dave is the lead instructor of the Monday night judo class.